Even though it is often overshadowed by the other more known precious metals, palladium does contribute significantly to the modern economy. Palladium is a popular metal for industrial uses due to it being ductile and resistant to rust. The lower price makes it attractive for dental usage in crowns and also as a potential treatment option for cancer when made radioactive. Making palladium a part of your bullion investment will continue to improve its significance over time due to the developing economic needs for this precious metal. Palladium is a member of the platinum family of metals, known as PGM along with platinum, rhodium, iridium, ruthenium and osmium. It is a by-product of platinum and nickel mining. Palladium is largely used in ceramic capacitors for electronics and for the manufacturing of catalytic converters, which convert harmful exhaust gases. Palladium will play a key role in the coming years, as India and China take their places as global economic powerhouses. There will be an increased demand for consumer goods in these densely populated countries, especially for electronics and automobiles, where palladium is essential for production. There are different ways to hold your palladium investments. You can store in a fully insured secure facility and arrange personal delivery. 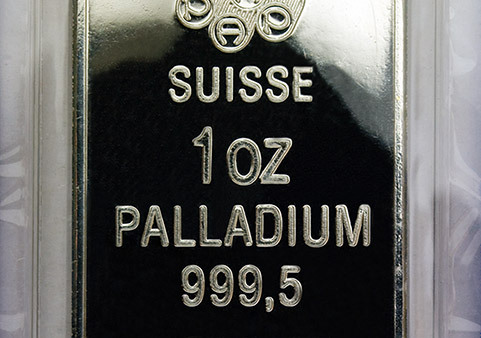 If you would like to add palladium to your investment portfolio, get started here.